... is not gold, as the saying goes. The contents of this old bottle appears to be glitter. Plain, gold colored glitter. 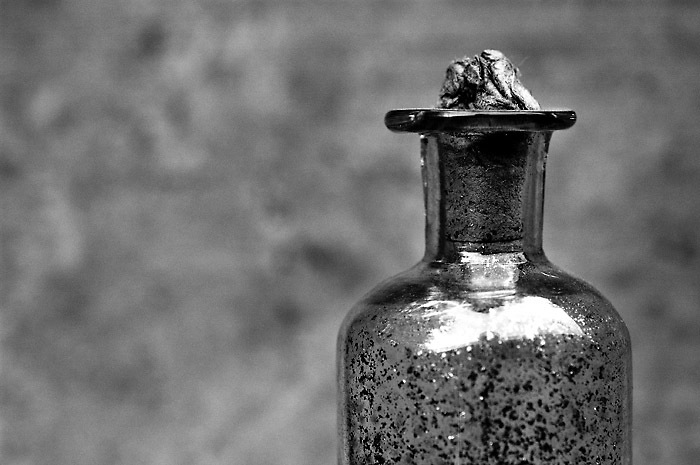 On the other hand ... an active imagination might fancy the notion that considering the age and condition of the bottle, the contents might actually BE gold dust from some assayer's office of yesteryear. In that case, some of what glitters might, in fact ... nah, it's probably just glitter. And for anyone wondering why I wax long and tediously about the gold color in a black and white photo, well, it IS gold in actuality (the color, not the element) but this is one of several black and white shots I've begun to assemble for a couple of fabric covered panels Weez and I want to hang at one end of the living room. Hence the absence of color here.